I love Brazil nuts, and I think they may be one of the most underused nuts in the kitchen. They are the best food source of selenium on the planet. Selenium is a trace mineral that is vital in the body’s defense against free radicals. For this reason, Brazil nuts are a powerful anti-inflammatory and anti-cancer food. If you are looking to increase selenium in your diet, Brazil nuts are an easy way to do so. 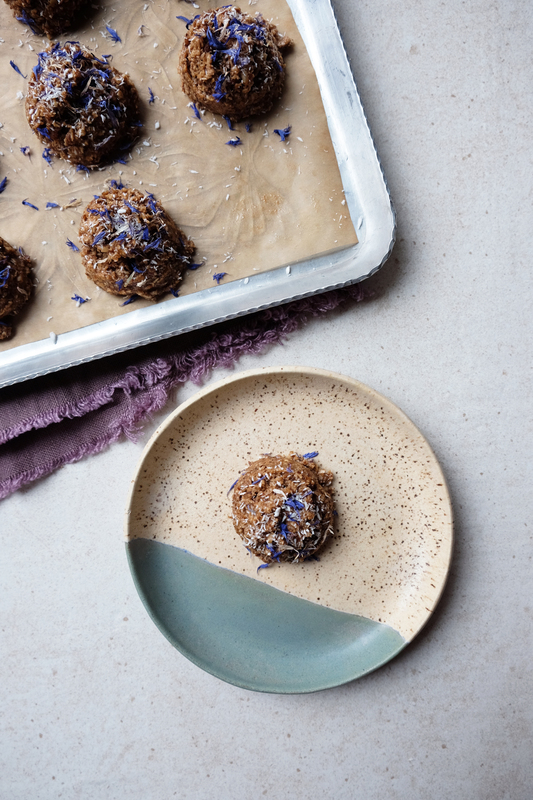 These Super Magical Adaptogenic Power Snacks are packed with selenium, healthy fats, warming spices and important brain and beauty foods, chaga mushroom and tocotrienols. Chaga protects against DNA damage, slows the aging process, supports radiant skin, eyes and hair and promotes overall well-being. Tocotrienols are derived from the bran of organic brown rice. They are a highly concentrated source of fat-soluble natural vitamin E, which is known for supporting healthy connective tissue and skin. Both chaga and tocotrienols are also great and easy additions to your morning smoothie. 1.) Mix half of the dried coconut and all the other ingredients except the ground flax seed in a food processor until a dough forms. Dough will be on the wetter side. 2.) In a large mixing bowl using a rubber spatula, fold the additional dried coconut and all of the ground flax seed into the dough until well combined. Dough should be tacky. 3.) 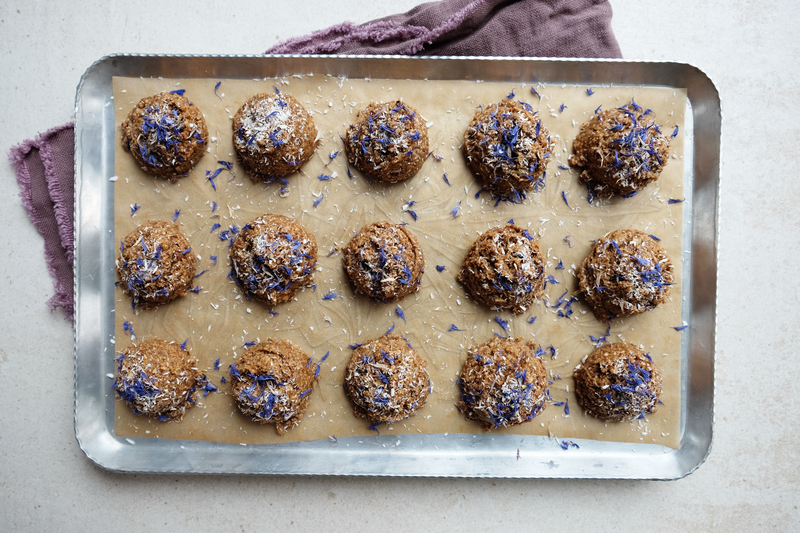 Using a cookie scoop (or another utensil), scoop (or form) 2″ round balls onto a parchment-lined baking sheet. Sprinkle with dried coconut and cornflowers, or any other toppings you desire. Allow to freeze for at least 30 minutes before enjoying. 4.) Store balls in an air-tight container in the freezer for up to a month. You can eat them straight out of the freezer or allow to thaw for a few minutes before eating. where do you get all your gorgeous pottery?! I collect it from all over. I’ve tagged some ceramists in my Instagram photos for reference.